Gallery owner Trish Juniper with Deborah Ralph-Kafarela and her work Gerard, the Trumpeter. DARLINGTON’S Juniper Studio will host work by Deborah Ralph-Kafarela in a series of exhibitions by emerging local artists. 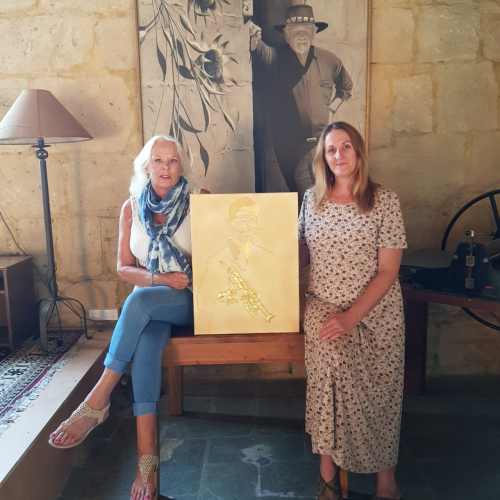 Gallery owner Trish Juniper said the former Curtin University student explored the concept of identity through the history of her ancestors, who contributed to the Sydney music scene before, during and after World War II. The ‘I am Deborah Ralph’ jazz-themed collection features pieces mainly created in wood, acrylic, wax and gold leaf. Former director of Christie’s London, Mark Alderson, will open the exhibition at 2pm on Sunday, April 29. Viewings of work by the late Robert Juniper will be available on request at the Dalry Road studio. Call 9299 6064 or email trish.juniper@gmail.com for more details.